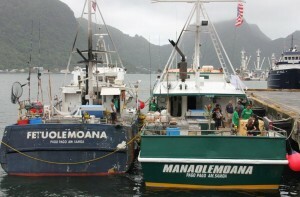 American Samoa longline vessels docked at Pago Pago harbor. Meetings leading up to the convening of the 164th Western Pacific Regional Fishery Management Council continued yesterday in Utulei, American Samoa. The Pelagic and International Standing Committee began the day supporting recommendations of the Council’s advisory bodies that met in Utulei on Monday as well as those of the Scientific and Statistical Committee (SSC) and the US Permanent Advisory Committee (PAC) to the Western and Central Pacific Fisheries Commission (WCPFC), which met earlier in the month in Honolulu. Also meeting yesterday were the Program Planning Standing Committee and Executive and Budget Standing Committee. The Council will consider the recommendations of these advisory groups when it meets today and tomorrow at the Lee Auditorium in Utulei. One topic of concern to multiple advisory bodies is the American Samoa tuna fleet, which consists of longline vessels targeting South Pacific albacore and purse-seine vessels targeting skipjack. The local longline vessels have suffered from reduced catches, possibly due to an unchecked, four-fold increase in the Chinese fleet in the region, while the local purse-seine vessels have suffered from a reduction in their traditional fishing grounds in the Kiribati exclusive economic zone (EEZ) from 4,313 fishing days in 2014 to 300 days this year. Established by the United States for its purse seine vessels, the Effort Limit Area for Purse Seine (ELAPS) includes all areas of high seas and US EEZ between 20 degrees N and 20 degrees S in the WCPFC Convention area, i.e., the Western and Central Pacific Ocean (WCPO). US purse seine vessels have been shut out of the high seas and US EEZ since June 15 when the US purse seiners reached the US limit of 1,828 fishing days. “American Samoa’s economy is tuna dependent, and it has a tuna fishery that includes the purse seine, longline and alias that are based there,” states the PAC recommendation. “The US needs to advocate for its tuna fishery based in American Samoa.” According to the PAC, current conservation and management measures of the WCPFC that limit high seas days is damaging to the US purse seine fleet and the canneries in American Samoa. Additionally, Council advisory bodies recommend that NMFS expedite its economic analysis of the impacts of the US purse-seine effort limit rules. 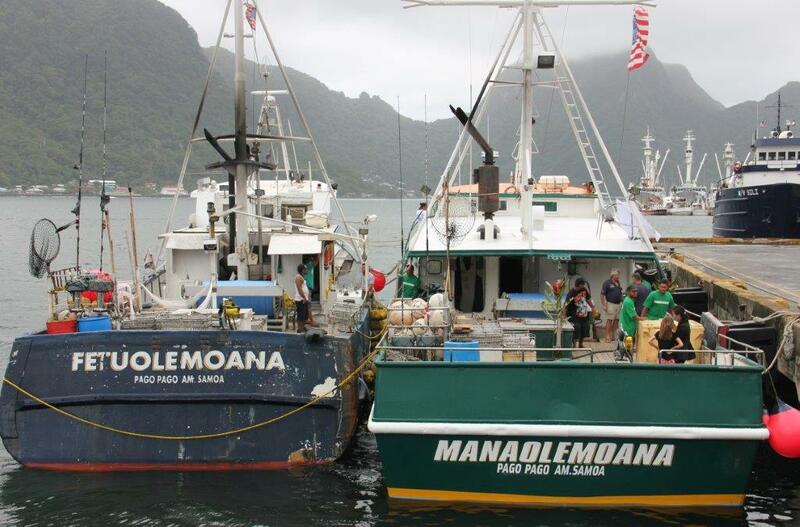 A petition filed on May 12 by Tri Marine Management Company to open the ELAPS to US purse seiners delivering at least of half of their catch to tuna processing facilities in American Samoa is being denied by NMFS due to lack of this information. The petition had unsuccessfully invoked the special requirements the WCPFC affords to Small Islands Developing State (SIDS) and Participating Territories, including American Samoa, in recognition of their aspirations to develop their fisheries. The second issue addressed by multiple advisors concerns bigeye tuna, which has been experiencing Pacific-wide overfishing for decades. The species is targeted by the Hawaii longline fishery, which reached the 2015 US quota of 3,554 metric tons (mt) in the WCPFC Convention area on Aug. 5. The fishery was closed in the WCPO for two months until NMFS on Oct. 9 approved a fishing agreement that allows the Commonwealth of the Northern Mariana Islands (CNMI) to transfer 1,000 mt of its 2,000 mt quota to the Hawaii fishery. The Council is tasked annually with recommending the bigeye quota for CNMI, American Samoa and Guam. Some advisers say the Council should specify the 2016 US Territory longline bigeye tuna limits at 2,000 mt per Territory or higher based upon scientific assessment that it doesn’t impede international bigeye conservation objectives, whereby 1,000 mt per Territory or more would be authorized to be allocated to US fishermen through fishing agreements approved by NMFS. Other advisors and a majority of the PAC recommend that the United States work to restore the bigeye catch limit applicable to the Hawaii longline fishery. The fishery’s 2009 level established by the WCPFC was 3,763 mt, i.e., the fishery’s 2004 catch of 4,181 mt minus 10 percent. It was noted that the Hawaii fishery is highly monitored, fishes in an area of low impact to the bigeye stock and supplies a local domestic market. It has also recognized the Hawaii longline fishery has been the only longline fishery to close down due to reaching its limit. The SSC and the PAC propose that the United States at the 12th regular meeting of the WCPFC introduce and strongly advocate for spatial management of the longline fisheries to conserve bigeye. The meeting will be held Dec. 3 to 8 in Bali, Indonesia. The SSC also suggests that work plans be developed to register fish aggregation devices as fishing gear, to research the Eastern Pacific Ocean as a bigeye tuna spawning area and to address observer coverage and monitoring. The PAC agrees that there are serious concerns of an uneven playing field with regards to compliance and monitoring within the WCPFC and recommends that the United States significantly increase its efforts to gain improvements in enforcement and monitoring of fisheries of other WCPFC member countries to a level that is comparable to the United States. Another common concern of the Council’s advisory bodies is the development of the American Samoa alia (small-scale catamaran) fleet. They recommend that the American Samoa Government allocate money it received for disaster relief to fix the alia in the Manu`a Islands to be seaworthy for fishing. They also suggest the Council work with the local alia fleet and the American Samoa government on training opportunities to improve seafood handling and quality, identification of export markets and reduced freight costs. Multiple advisory bodies also recommend that the Council select annual catch limits for bottomfish in the US Territories for 2016 and 2017 equal to the acceptable biological catch set by the SSC. This would equate to 106,000 pounds for American Samoa; 66,000 pounds for Guam; and 228,000 pounds for CNMI. For more on the Council meeting, go to www.wpcouncil.org, email info@wpcouncil.org or phone (808) 522-8220. The Council was established by Congress under the Magnuson-Stevens Fishery Conservation and Management Act in 1976 to manage domestic fisheries operating seaward of State waters around Hawai`i, American Samoa, Guam, the CNMI and the US Pacific Island Remote Island Areas. Recommendations by the Council are transmitted to the Secretary of Commerce for final approval. Western Pacific Regional Fishery Management Council: Appointees by the Secretary of Commerce from nominees selected by American Samoa, CNMI, Guam and Hawai`i governors: Michael Duenas, Guam Fishermen’s Cooperative Association (vice chair); Edwin Ebisui (Hawai`i) (chair); Michael Goto, United Fishing Agency Ltd. (Hawai`i); John Gourley, Micronesian Environmental Services (CNMI) (vice chair); Julie Leialoha, biologist (Hawai`i); Dr. Claire Tuia Poumele, Port Administration (American Samoa); McGrew Rice, commercial and charter fisherman (Hawai`i) (vice chair); and William Sword, recreational fisherman (American Samoa) (vice chair). Designated state officials: Suzanne Case, Hawai`i Department of Land and Natural Resources; Dr. Ruth Matagi-Tofiga, American Samoa Department of Marine and Wildlife Resources; Richard Seman, CNMI Department of Lands and Natural Resources; and Matt Sablan, Guam Department of Agriculture. Designated federal officials: Matthew Brown, USFWS Pacific Islands Refuges and Monuments Office; William Gibbons-Fly, US Department of State; RADM Vincent B. Atkins, US Coast Guard 14th District; and Michael Tosatto, NMFS Pacific Islands Regional Office. Click here for printable PDF.